HELL’S KITCHEN Las Vegas Season Three on Fox TV puts 12 new restaurateurs on the chopping block for a chance to win the ultimate culinary prize the coveted Head Chef of a new fine Italian restaurant at the Green Valley Ranch Resort and Spa in Las Vegas, Nevada real estate. Chef GORDON RAMSAY is back for a third season of the unscripted series HELL’S KITCHEN Las Vegas. Ramsay is putting 12 new would-be restaurateurs to the test in the kitchen. Terra Rossa Italian Restaurant at Red Rock Station Casino Las Vegas offers hungry diners authentic Italian foods including homemade pastas, wood-fired pizzas, fresh fish and an extensive antipasto table. The impressive wine room collection of 1,500 bottles of premier Italian and California wines. From his post in the open kitchen, Chef Renato DiPirro, who hails from Tuscany, brings the authentic flavors and warmth of Italy to the romantic eatery. The intimate setting evokes the feeling of a rustic Tuscan Italian villa and overlooks the outdoor water feature. 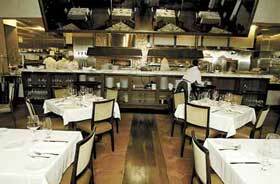 Terra Rossa offers indoor and patio seating, as well as private dining rooms for special occasions. 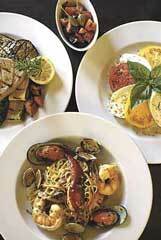 Terra Rossa Italian Cuisine in Red Rock Station Casino, 11011 W. Charleston Blvd., serves traditional Italian fare that’s “simple and hearty,” says chef Renato De Pirro. Clockwise is grilled swordfish and vegetables with Mediterranean relish, a caprese salad with buffalo mozzarella and tagliolini ai frutti di mare are some of the dishes at Terra Rossa Italian Restaurant. “We were trying to accommodate what people are asking for, especially off the Strip,” says De Pirro, who previously worked at Valentino’s in The Venetian hotel Las Vegas. Hungry diners will find pasta, spaghetti with meatballs, linguine, lasagna, plus an array of seafood, meat and an antipasto bar.